Commissioners will revisit slow-evolving redevelopment in 2019. SAN DIEGO — A planned presentation to update the Port of San Diego’s Board of Port Commissioners on the redevelopment of East Harbor Island – where Sunroad Marina is located – was postponed to a future meeting; commissioners were originally scheduled to discuss updates to the redevelopment on Dec. 11. Sunroad hopes to develop a 7-acre stretch of East Harbor Island with a new hotel. The port district’s staff report to commissioners stated the redevelopment could include some new requirements, such as building the hotel project with 450 to 500 rooms, all built within one phase and within one or two buildings. Port staff also hopes parking for the hotel project would be built in such a way its visibility would be as minimal as possible to anyone on Harbor Island Drive. Also suggested by port district staff: the hotel operator should be similar in quality to AC Hotels by Marriott, Element, Aloft, Hyatt Place, Hyatt House, Hilton Hotels and Resorts, Curio, Tapestry or Swissotel. It is unclear when commissioners will receive a presentation on the updated East Harbor Island redevelopment project. Just as unclear is when a decision on the project would officially be made – the Dec. 11 agenda stated the East Harbor Island redevelopment item was a presentation, but whether an action would have followed won’t be known until commissioners revisit the discussion in 2019. Redeveloping East Harbor Island has formally been on the port district’s agenda for several years now, but the project hit a major speed bump in August when commissioners failed to reach a consensus about how to move forward with Sunroad’s plans. Commissioners were set to revisit Sunroad’s plans almost four months later, but a presentation on the project’s updated elements will now have to wait until after the New Year. “The site has a potential to be a world class destination for visitors to stay and warrants distinct architecture and a sense of place,” port district staff stated in a Dec. 11 report to commissioners. The report added port district staff recently met with California Coastal Commission members and consistently received feedback from board members. Sunroad’s project team entered into an exclusive negotiating agreement with the port district on April 1, 2017. Initial presentations of how the redevelopment project would look like were provided on several occasions during the first half of 2018. At least three meetings were held with Coastal Commission staff between July 9 and Dec. 5. No one yet knows what would be included in Sunroad’s final redevelopment plans. Commissioners could still give additional input, require more or less of the developer, in relation to staff’s current recommendations (450-500 rooms in one phase, hide parking element, limit project to one to two buildings, brand name, etc.). Car rental companies servicing nearby San Diego International Airport had previously used the site where Sunroad hopes to build its hotel project. The “elbow parcel,” as the East Harbor Island site is known, is located in between San Diego International Airport and the city’s downtown urban core. 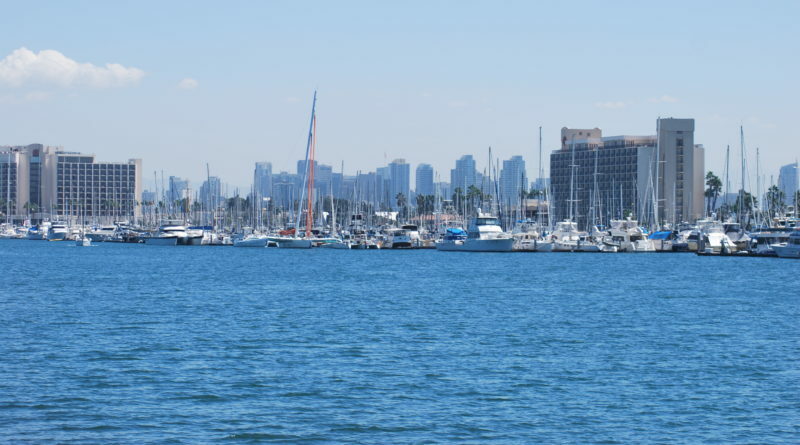 The eastern portion of Harbor Island features uninterrupted views of the Downtown San Diego skyline.